Are you ready to make money online with the fastest growing affiliate network on the Internet today? If you’re wondering about how to become an affiliate with WOW Trk, the registration process is really easy to follow and only takes a couple minutes of your time. The first thing you’ll want to do is click on the “Register Now” button located near the top-right corner of the main WOW Trk website. This will bring you to the page shown below where you can choose between signing up as an affiliate or signing up as an advertiser. Since you want to know about how to become an affiliate, it makes sense to choose the former. The main sign-up process with WOW Trk consists of three components: registration, verification and approval. On the first page, you will need to provide your account details. This starts with basic information like your name, address, phone number and VAT/Tax ID, if applicable. For your phone number, remember to enter it in international format with the country prefix. This is a very important step, because WOW Trk will call this phone number, providing you with a PIN that you can then enter into the system to verify your account. Below this, you will be asked for the URLs to any websites you may be using for the purposes of promoting the hundreds of great affiliate offers as part of the WOW Trk inventory. You will also be asked whether you plan to promote these offers via email marketing. Once you’ve completed this registration form, tick the checkbox indicating that you agree to the Terms and Conditions, then click on the large Sign Up button at the bottom of the page. This will bring you to the telephone verification page. 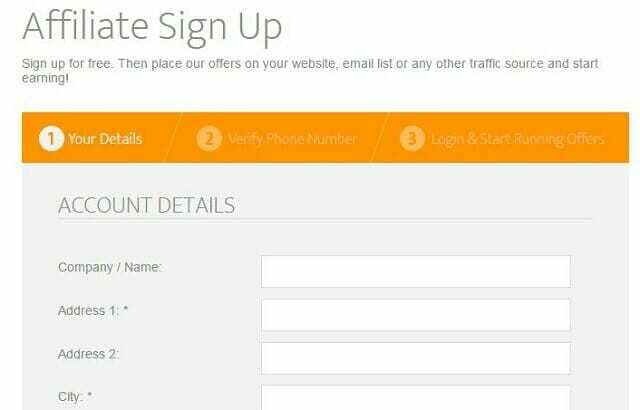 Upon successful verification, you will gain access to the affiliate dashboard and can start running offers right away. It’s that easy to become an affiliate with WOW Trk. You can optionally skip the phone verification step, but that will place your application in “pending” status, awaiting manual review by the WOW Trk verification team. Your account will be reviewed in two to three business days. Once inside the affiliate dashboard, you can browse through the available offers, access the contact information for your affiliate manager, and adjust your account settings. And remember that WOW Trk is an international affiliate network, so it doesn’t matter where you are in the world. Now you’re ready to earn more money from your traffic!